​​Because we value your time, the No-Hassle Fundraiser is the primary way FQMS PTA campaigns for donations. We hope to raise $55.00 per student to meet our budget - ​​but - ANY amount you can contribute will help us in keeping Folly Quarter great!!! Purchasing A COMMUNITY COUPON BOOK Allows The PTA To Earn $10.00 Back. Purchasing A FQMS LOGO WATCH Allows The PTA To Earn $10.00 Back. Dropping Off Your Unwanted Items In Our DROP OFF DONATION SHED Allows Us To Earn Cash Back (Per Pound) Donated And Collected. Participating In Our RESTAURANT MONTH Selection Of Restaurants - Allows The PTA To Earn As Much As 20% Back On Meals Purchased. Attending One Of Our PTA FAMILY SOCIAL EVENTS - Allows Us to Generate Higher Participation Numbers = More Support = The More We Are Able To Offer. ​The PTA continues to offer various ways to support FQMS through various shopping opportunities. ​Some of the programs are listed below. 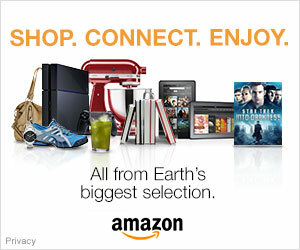 ​Amazon.com is one of the most easy & popular ways of on-line shopping. The FQMS PTA offers a link for you to use to access Amazon.com. By accessing this way, you get your shopping done while supporting the FQMS PTA which supports Amazon.com. Click the link below. ​Proceeds from Box Tops for Education and recycled ink cartridges are used to support the PTA. Please place Box Tops and ink cartridges in the designated collection boxes in the Front Office. ​Register with the following merchants and a percentage of your usual purchases will benefit FQMS.